INDIAMART.COM, A third party B2B marketplace, started in 1996 when internet was in its infancy in India and B2B was unheard of. When Dinesh Agarwal transferred himself from HCL America to HCL India towards the end of 1995, the entrepreneurial spirit in him already had a plan brewing. After six months, he left HCL to concentrate fully on his maiden venture – Indiamart.com. Says Agarwal, “From 1992 to 1996, the internet was undergoing a lot of growth in the U.S. The World Wide Web had started catching up. When I returned to India, I wanted to start an internet business, but realised that ISP business was monopolized by VSNL. So I decided to start some business around the internet.” Agarwal realised that there were many Indian exporters whose products were in great demandin the West. Since India didn’t have good net penetration then, he decided to make his business West- centric, as simultaneously, India was emerging as an attractive tourist destination. .
To address this issue, Indiamart coined the phrase ‘free listing with free query forwarding. “At that time, free listing was being offered on the net though free query forwarding didn’t exist,” claims Agarwal. A lot of Indian exporters hadn’t heard of the net at that time-and Indiamart couldn’t have waited for them to become net-savvy. “So, we sent out free listing forms to exporters and suppliers and told them that the queries that we get for them will be forwarded to them through post, fax, phone, or even email, in case they had access to the net. E-mail wasn’t a major cost to us, but fax and post did cost us, ” informs Agarwal. Today Indiamart receives around a lakh of queries every month, out of which, it sends out around 6000 queries by post. Though the volume of enquiries got from the marketplace has increased, the number of suppliers whose queries had to be forwarded by post or fax has reduced. Gradually the buyer and the supplier base too grew. Meanwhile, in late 1996, Indiamart forged an alliance with ASSOCHAM. The agreement was that Indiamart would promote ASSOCHAM’s members free of cost on its web directory for a year. This contributed substantially to the growth of the site’s database. Some of the industries like apparels, chemicals, handicrafts, health and automobiles grew faster than the others. Realizing the potential, Agarwal started forming a vertical segment for these industries within Indiamart’s horizontal portal model. This triggered a chain reaction and, in a few segments, the number of clients increased nearly eightfold within a short span of time. Out of 1,200 catalogues on Indiamart.com , fully developed vertical sections like auto, travel, handicraft and apparel account for almost 60-70 percent. Keep growing with money, honey! 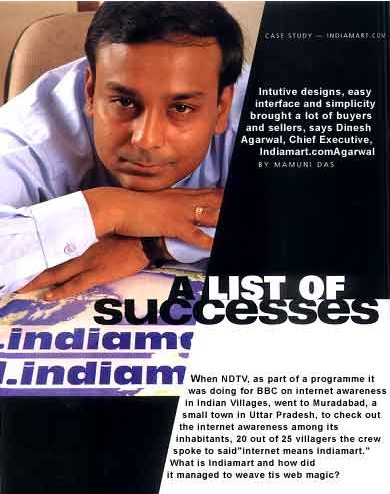 Indiamart started with a catalogue model, which had a one time and also a recurring fee structure. It has now emerged as a one-stop solution provider, with its services ranging from domain name registration, designing, hosting, search engine promotion to catalogue maintenance. Indiamart has come a long way since the days of its birth, when it was a one-man show, with Agarwal operating from his dining table! Today, Agarwal, with a team of 160 professionals is busy planning to shift to a new 18.000 sq. feet office in Noida, from the present cramped 6,000 sq. feet office. Now what do we call this; growing up with B2B?